I use them for cereal sugar and others things love them will buy again. This is a great product at a very reasonable price. Lids seal completely to prevent bugs and keep out moisture. The tall, slender sizing takes up less room than the various product packaging (sugars, flour, pastas, dried beans, etc.) plus protects contents. These three together cost less than just one such product in all others I've seen of equal quality. Highly recommend this item. Great storage, good quality, Many uses!!! I love these. They make good cannisters to store things that you want to keep fresh. I love these. I have flour, sugar and Himalayan salt in the small one. They are worth every penny. Always need taller storage items. I need this kind of containers, Miles Kimball always have something goo,for good prices. I already have a set for all of my kids snacks and want to get more of them, they are fantastic! Have wanted some cereal storage items. Comments from others that bought made me decide to give them a try. I have tall things I have to store. These are more convenient! THEY ARE WONDERFUL STORAGE ITEMS AND I MADE MY PANTRY A LOT MORE ORGANIZED. A practical way to solve a mouse problem. I have bought these before but needed more. Love that they are air tight. Keeps grain bugs out of food. Love these and would recommend them to anybody. My current vacuum cleaner does not have enough hose to reach the ceiling. The plastic containers hopefully will hold lasagna. 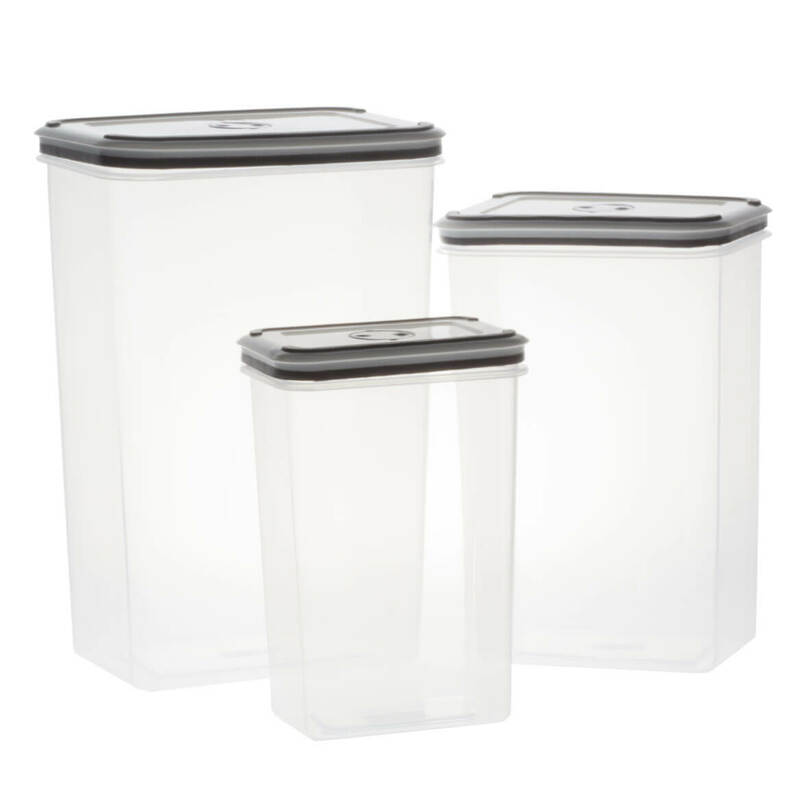 Rectangular containers reduce my storage issues because of their shape which takes up less space and allows closer positions in the cupboard. I have limited space to store my new grains like quinoa, farro and freekah, and these sizes will help. Like to keep cereal in something like this. I choose this item to organize my pantry and keep food fresher for longer. 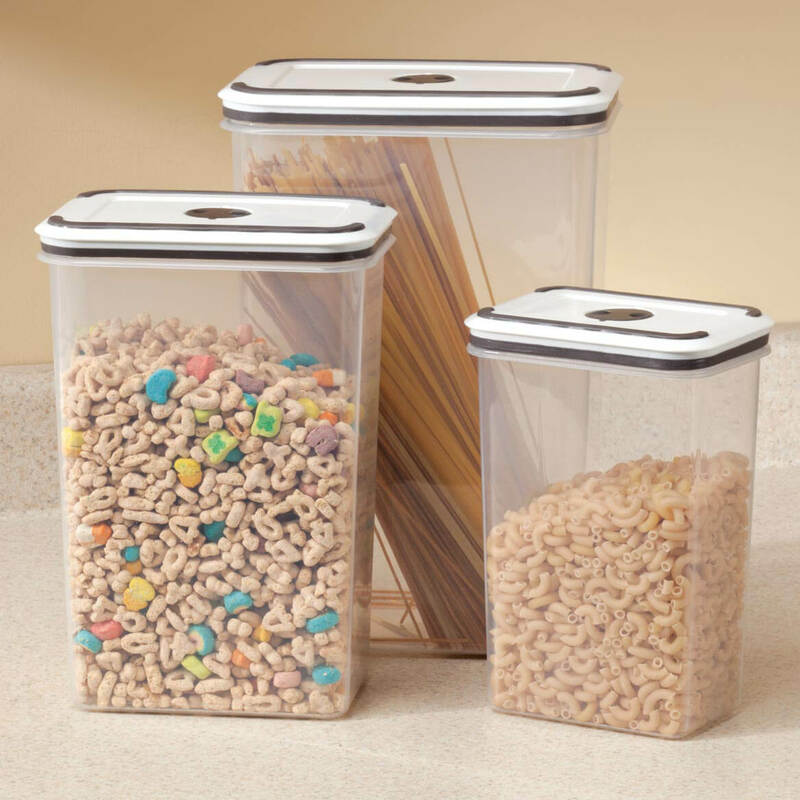 It is difficult to find containers to store cereal. I have ben looking for a set like this to save space hope they work. I need something to contain spaghetti, rice, sugar, flour etc that does not take up alot of pantry space. These seem like they will do the trick for me !!! I really wanted this food storage set, but when I placed the order it was out of stock. It was removed from my order. I want them so I can see how much I have left of a product and like the seal tight closure. To store cereal, rice and spaghetti. What is the height of each container in inches? BEST ANSWER: Thank you for your question. The dimensions are 10.6” H X 7.28” L X 5.12”W , 9.06” H X 6.1” L X 4.33” W, 7.27” H X 4.96” L X .54” W. We hope this information will be of help to you. How does it close? Lock & Lock or like Tupperware? BEST ANSWER: They seal tight, I love them, I use them for dry cereal. I bought 2 sets of them. As I keep a variety of dry cereal on hand. I store them on their side in my pantry. They fit together well, BUT the tops pull off, you must use care in handling. Unlike Tupperware where the lids snap on. I would suggest careful handling, and NOT LIFT them from the lids. They are air tight though. I would highly recommend them; with adult supervision around small children. The lids close like Tupperware. I bought (2) sets & really like them. I keep dry pasta & also cereal in them. Thank you for your question. It is a snap on lid. We hope this information will be of help to you. BEST ANSWER: Thank you for your question. Yes, they are BPA free. We hope this information will be of help to you.